Steep has some interesting moments, but it's ultimately pretty shallow. Read on for our early impressions. Steep is a GoPro filmmaker fantasy. It allows you to visit some of the highest reaches on Earth to challenge the slopes of mountains in the Swiss Alps via snowboard, ski, wingsuit, or parachute, all with the option of viewing it in an impressively accurate first-person perspective. And to its credit, it's pretty effective. The wind rushes through your ears, the field of view is shaky and tossed about by the slightest change in movement pattern, the snow caves beneath your snowboard and skis, and there's a rush to it that I imagine is a decent re-creation of what it feels like to take on nature in this defiant manner. But the more I play, the more I'm suspecting a majority of Steep's development was poured into beefing up this aspect of it and not necessarily making it into the best game it could be. 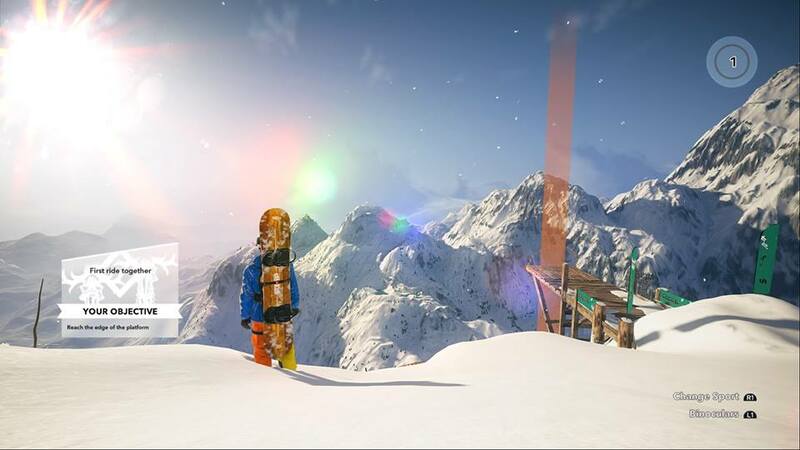 There are neat aspects of Steep. The environments are beautifully rendered, made up of striking vistas and comfortable mountainside villages. The character animations are elaborate and complex, changing as they trudge through varying depths of snow and alternate between walking, running, and crawling along steeper inclines. Gliding along and cutting through the powder on a snowboard or skis has a smooth, natural feel, and flying through the air in the wingsuit or parachute feels strangely peaceful, yet chaotic. Everything about it visually is extremely well-executed and evocative. But peel away impressive visuals, and you're left with a game that seemingly holds itself together with haphazardly-placed thin threads. 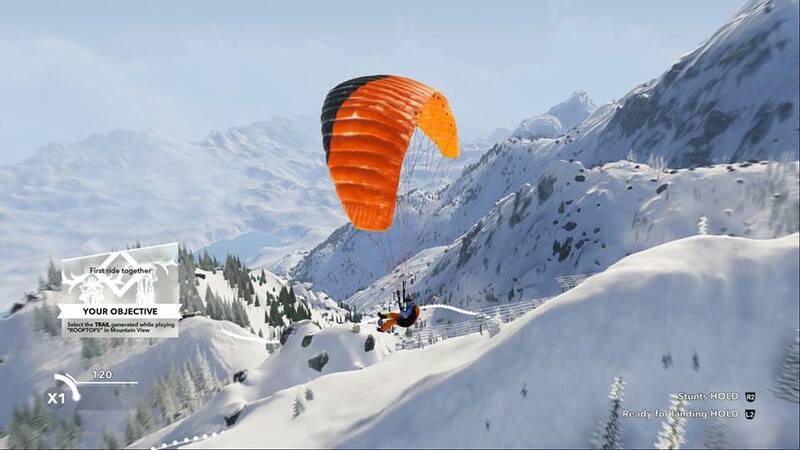 Being that it's an open world extreme sports game, you're encouraged to explore around the mountains, detecting drop zones and finding new challenges to participate in. This starts off encouraging; you can race, perform freestyle stunt rides, and attempt to control your trajectory on a number of different paths made specifically for the sports available. 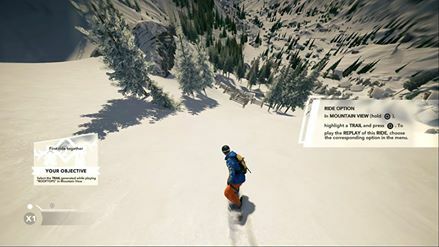 But Steep's attempt to be a multi-faceted game dilutes its actual gameplay to the point where it's not a test of skill or reflexes; it eventually devolves into running through the motions, navigating the slopes and air wthout having to worry about any drastic consequences as a result of failure. There's even a quick reset button that will transport you instantly to the start of a challenge should you make any grave mistakes, making it one of the more forgiving extreme sports games I've played. It's mechanically simple to the point of not being challenging or fun; complex tricks are pulled off by single button presses, in-air courses are really just a challenge to get your elevation gauged correctly, and it feels like something that wants to be a game to all people, but doesn't nail the approachable-but-complex intersection it needs in order to be successful in that pursuit. The visual design also gives it a sense of homogenity that eventually becomes downright boring. Once you've seen one slope, you've more or less seen them all. Characters don't have much of a sense of personality, and the entire thing feels more like a surface-level experimental photo mode than a fully-formed video game. But, I plan to invest a few more hours into it for the sake of attempting to get a better sense of it before issuing a final verdict. Looking forward to reading that... I've been on the fence about this game. It's been getting Average reviews... heard controls aren't really intuitive at all. I tried the Beta and I agree the controls felt off... granted dunno if they made any improvements for retail. That's unfortunate. It's not really my type of game, but it sounded pretty neat when I first heard about it, and it certainly looked good. Man, a wingsuit game could be intense in VR... if it controlled like Eagle Flight with steering; possilbly Touch/Vive controllers for balance/additional steering? You could put the controllers down by your side to reach terminally velocity, Johnny Utah style.